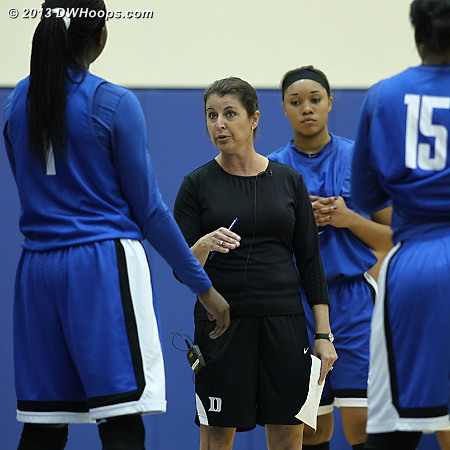 Coach P hard at work directing Duke's first practice of the 2013-14 campaign. Click Horns for More Info! 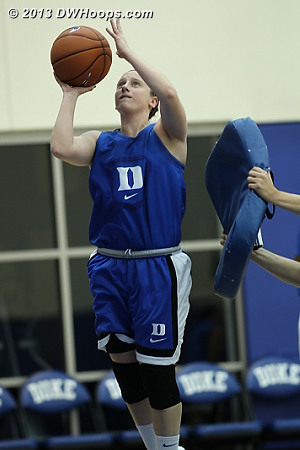 Amber Henson, who redshirted the past two seasons due to knee issues, was on the court for some of the drills Wednesday. 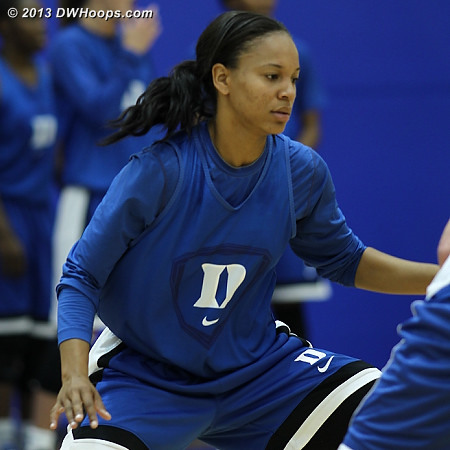 Freshman Oderah Chidom in her first Duke practice. 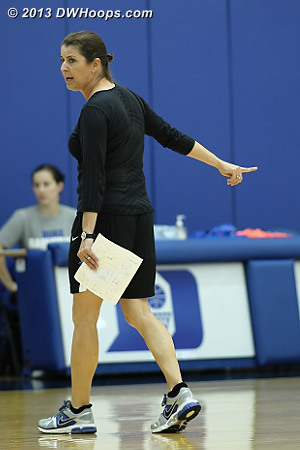 Two words that came to mind while watching the Duke women's team opening practice for the 2013-14 season were "pace" and "pressure". From the very beginning, all of the offensive drills were full-court sprints, ending with a manager under the basket with a pad impeding the players as they attempted to finish at the rim. 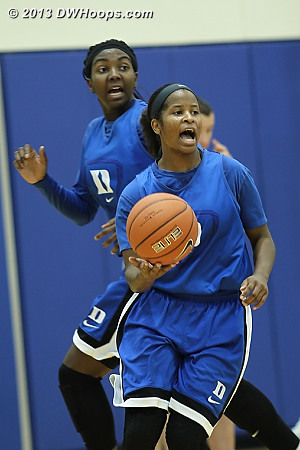 This team has added some up-and-down speed with new players like Oderah Chidom and Kianna Holland, but the point of the drills was to instill an attacking mindset in every player, and to get comfortable finishing plays with contact. 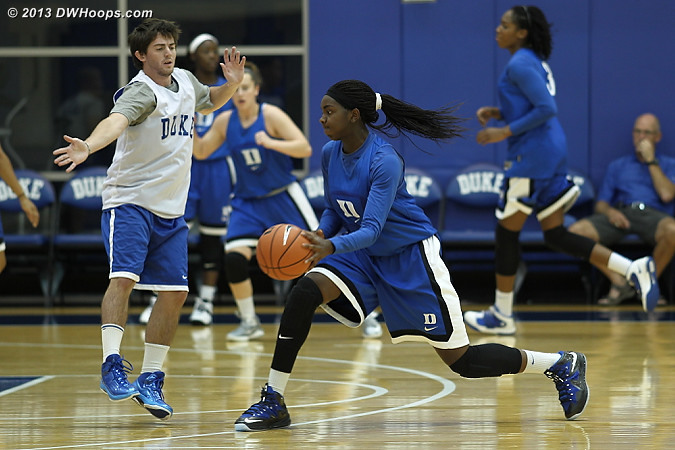 The team repeated this full-court sprint until the team finished eleven baskets in a row. 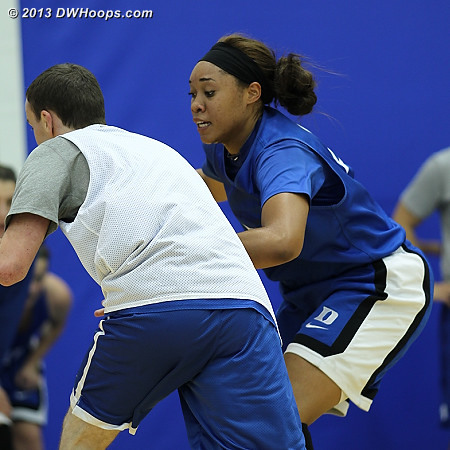 There's no doubt that Duke will try to run as many opponents off the floor as possible this season. Defensively, Coach P had the team try various pressure schemes but focused on one-on-one ball pressure at various spots: baseline, outside the three point arc, in the post, etc. The idea was to keep a low and wide stance while sliding as quickly as possible. The team tackled these drills with intensity, looking more organized on the defensive end than on the offensive end at the moment. 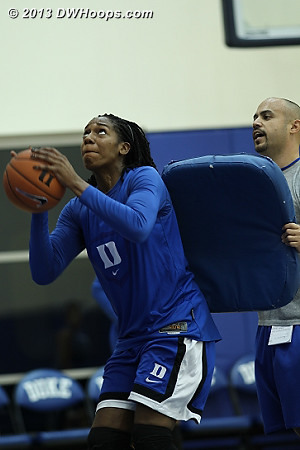 "Focus" was the word I heard most often at the practice, as the players and coaches exhorted each other to zero in on each drill and get it just right. 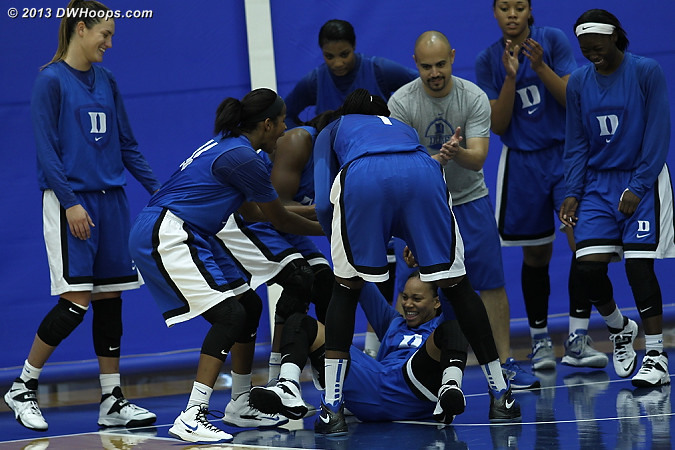 Elizabeth Williams is 100% physically, and she showed it on the floor. She's in good shape and was running the floor with grace and ease. 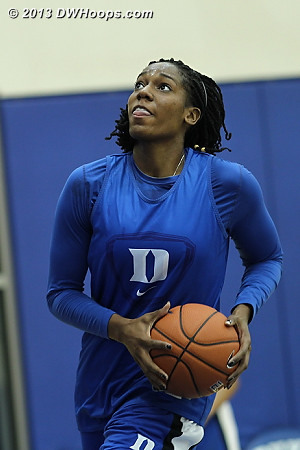 Chloe Wells is back on the floor and officially rejoined the team on October 1st after a brief suspension for unspecified reasons. She's a bit slowed by a mild shin injury but is otherwise ready to go. 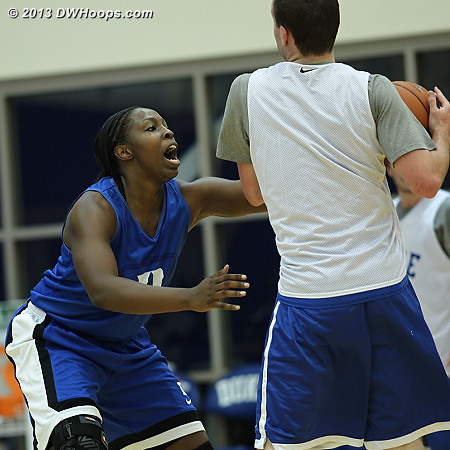 Chelsea Gray is cleared for full contact practice and she displayed her trademark cleverness at getting to the hoop. She's not yet at her physical peak, as her lateral movement is somewhat slowed. This is a problem that's not expected to linger as she gets back into top shape. Tricia Liston and Haley Peters were their usual selves. Both look quite fit. Liston was also quite clever at finding different ways to attack the basket. 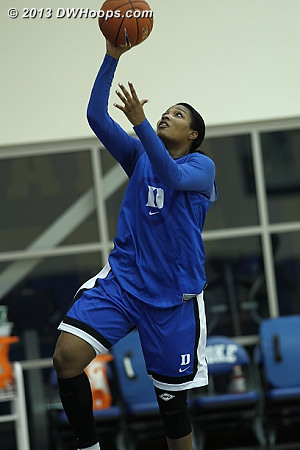 My gut tells me that she will challenge Williams to be Duke's leading scorer this season. 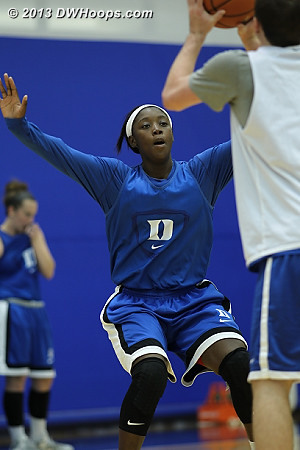 Richa Jackson's knee is 100% rehabilitated and she looks to be in very good shape. Her movement on the floor was free and easy. 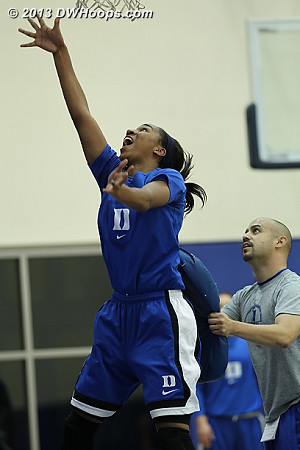 Her jumpshot still looked wonky, but she has time to fix that since she's no longer being held back by her body. 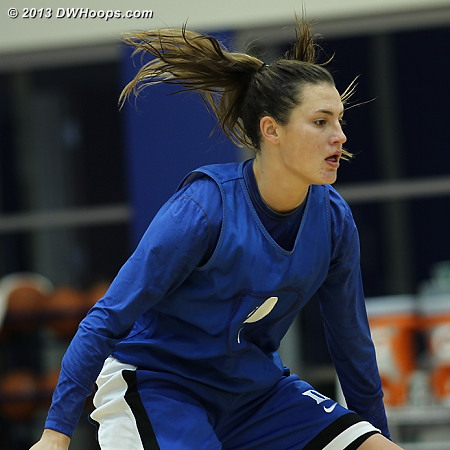 Amber Henson was participating in practice, I'm happy to report. She is understandably rusty after barely playing the last two+ years. 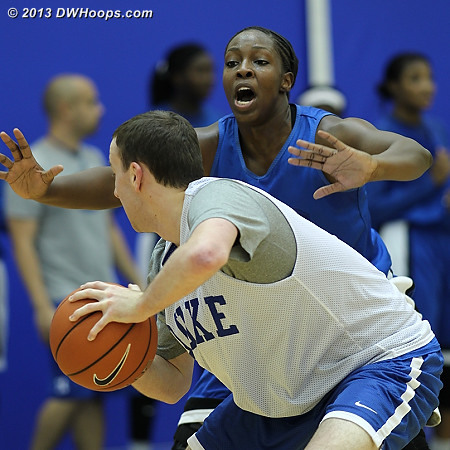 She will get some run this year, but it's unclear how effective she can be this season. It is likely that she might play more than she practices. 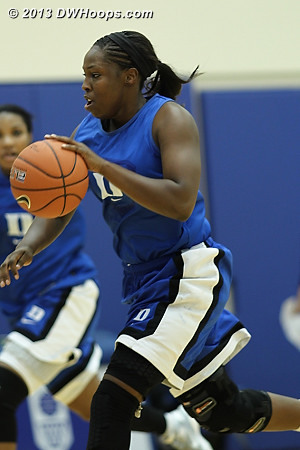 Oderah Chidom will definitely get lots of playing time. She's an intense, graceful player who handled the ball on the break nicely on one occasion. 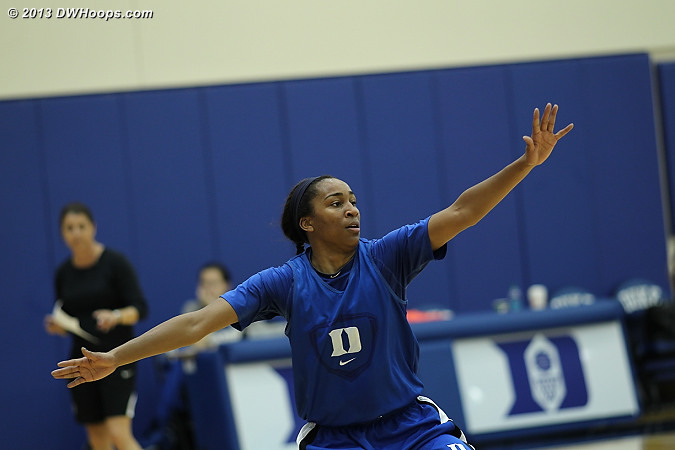 Her main issue this season will be getting stronger and finishing with contact. 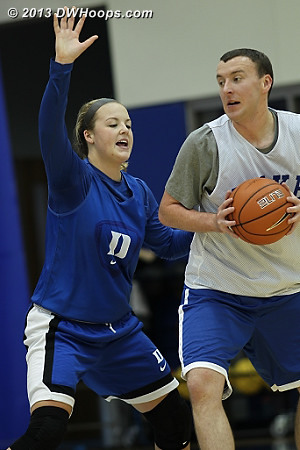 When Duke will need a rebound, this will be one player Coach McCallie will turn to. 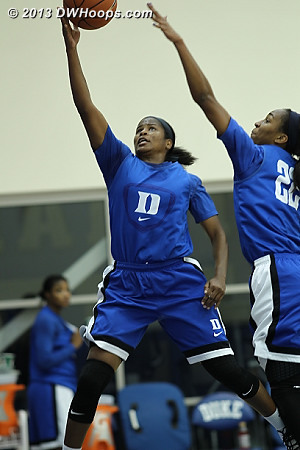 Kendall McCravey-Cooper has a big, strong body but she can run the floor and handle the ball. 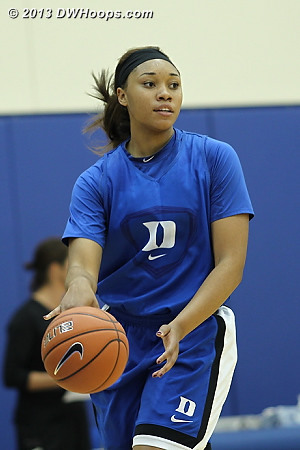 How successful she becomes at Duke will depend on game-to-game intensity and focus as well as a willingness to mix it up in the paint. There's no question that she has the tools, the size and the strength to dominate. 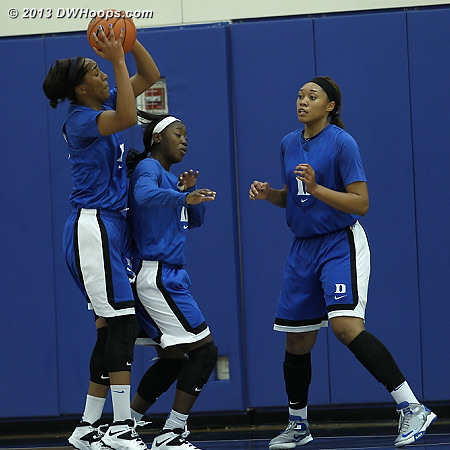 Alexis Jones and Ka'Lia Johnson looked like their usual selves. Jones is playing with a lot of confidence right now. 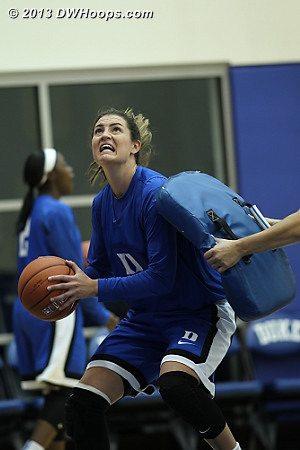 Finally, three players did not participate in this practice: frosh Kianna Holland & Rebecca Greenwell as well as redshirt frosh Katie Heckman. Holland is dealing with a minor injury and is expected to return to practice soon. 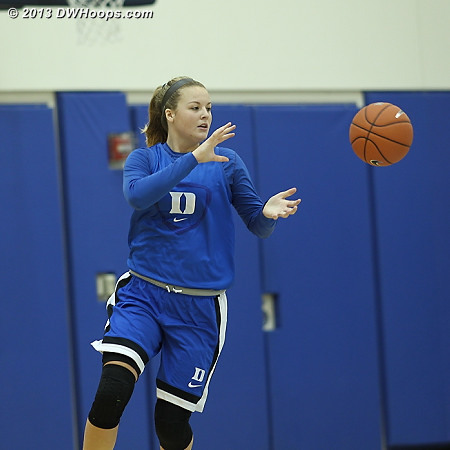 Greenwell is of course still rehabbing her knee after surgery last spring. While nothing has been made official, she may not play at all this year. 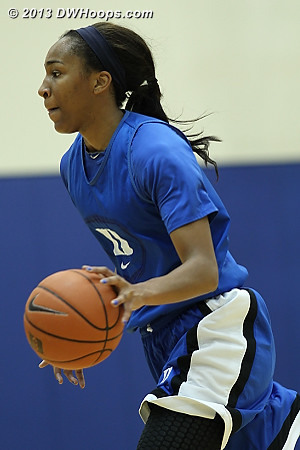 This will depend on many factors, including her rehab schedule and the deep makeup of the team. Heckman is also still rehabbing from her knee surgery. She has no timetable for return, but it's not expected to be soon. DWHoops Members - please log in to see all 100 photos. Not a member yet? Click here for info on our $20 season pass!